The Fashionista team is in Paris, bringing you the best of the collections. 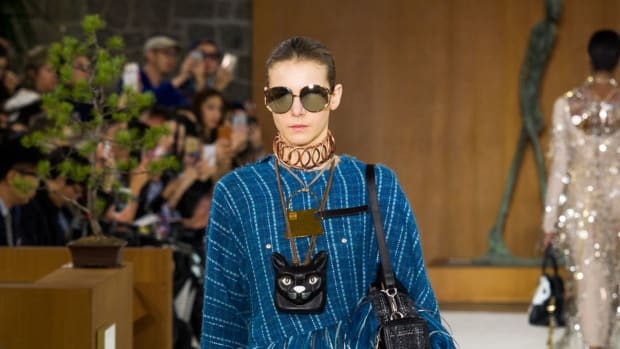 Read on for our first-hand reports on the latest from the runways, including Loewe, Isabel Marant and Dior. Click through for our report on Jonathan Anderson&apos;s stellar womenswear debut for the Spanish fashion house. Hussein Chalayan propped a set of Moorish screens at the front of the runway he used to showcase his spring 2015 collection in Paris on Friday morning, a nod to the North African and Andalucian influences on the collection. The shadows that poured through underlined Chalayan’s interest in chiaroscuro, the Italian word for the interplay between light and shadow. The same pattern appeared on a few dresses -- a dainty off-the shoulder frock, a halter maxi and a strapless ladylike peplum number -- and on light blue, breezy slacks. Plunging necklines and dropped lapels on jackets showed a sophisticated sexiness. One wispy blue-grey halter dress showed his ability to take a traditional shape -- the peplum -- and make it his own. Click through for our review of Raf Simons&apos;s stunning spring collection. "Make Do and Mend," was the title of a pamphlet handed out the British government during World War II. It was targeted at women, offering them ideas on how to transform their old clothes into something more current since buying new was out of the question in such a resource-limited time. The team behind Maison Martin Margiela took this idea to heart for spring 2015. "The collection suggests that one revisits their unique, personal garde-robe and reinvents it," read the show notes.